She might have a rough-and-tumble name and sport a mohawk, but Harley the cockatoo is all about fun and games. The curious cockatoo has amassed quite a flock of admirers, with more than 3.3 million YouTube views of this viral video (below). In the video, which is just one of many on her personal YouTube channel, Harley is seen gripping a small orange cup and yelling into it. 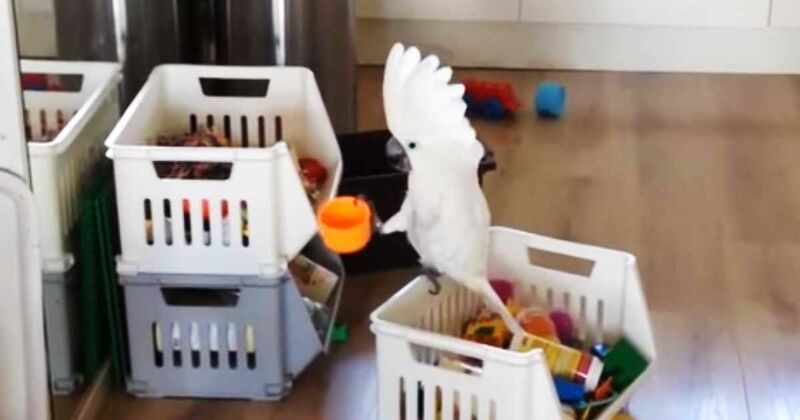 These types of birds are extremely intelligent, and she seems quite proud of herself for figuring out how to make her voice echo inside the plastic cup. The 8-year-old bird is seen yelling into the cup, then looking almost giddy once she's realized what she's done. Harley continues to scream into the cup and get increasingly excited over her newfound toy. In her profile, Harley's mom explains all the hard work it took to get this bird to behave. Since cockatoos, a type of parrot, are so intelligent, it takes a lot to keep them occupied and out of trouble. But it looks like Harley is doing just great with her family — constantly learning and playing. Harley's antics have charmed millions — and probably gotten them to replay the hilarious clip a few dozen times over. Be sure to check out the hilarious video below! Too funny, right? Don't forget to share this video with your friends on Facebook, Twitter and Pinterest!